The West Yorkshire Clarets had planned to hold their March meeting this Thursday in Huddersfield but their plans have changed due to the planned strike action this week which would prevent many from attending. The meeting, which will be held in the Grove Inn at Grove Street, Huddersfield, HD1 4DP, will now be on Thursday 5th April at 7:30 p.m. As always subs will be £2 per member (£1 for unwaged) but if you are attending for the first time there will be no subs due. 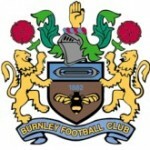 Should you wish to know more about the meeting or the West Yorkshire Clarets in general, please EMAIL them.